Just looking down at the sheer 50-meter drop is a dizzying affair. But not for the 120 skiers and snowboarders competing at the ARAG Big Air Freestyle Festival beginning in the first week of December. 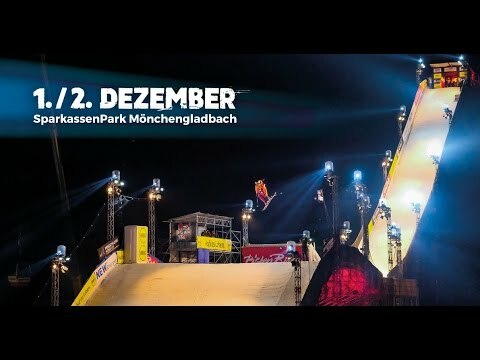 After the success of the previous event in Mönchengladbach in 2016, NUSSLI once again built the biggest FIS Big Air Ramp for this year’s competition. Within just two weeks, a project team of around 30 members realized the 49-meter-high Big Air Ramp built using over 400 metric tons of steel, wood, and concrete. Measuring 120 meters in length, the temporary mega-ramp stretches across a total of three plots of land, traverses a two-way street, as well as the forecourt and grandstand tiers of the neighboring ice hockey stadium, and finally coming to an end on its ice rink. The athletes are transported up to the 49-meter-high starting platform via two elevators. The trip up to the top takes two minutes. These dimensions require accurate planning down to the centimeter and a great deal of finesse during construction. With a load of more than 1,000 cubic meters of snow, the structural integrity also played a key role. This was already the second time that NUSSLI built the Big Air Ramp in Mönchengladbach, allowing the company to benefit from its experience from the previous year and optimize the construction workflow. Picture: NUSSLI once again built the biggest FIS Big Air Ramp for this years ARAG Big Air Freestyle Festival. NUSSLI once again built the biggest FIS Big Air Ramp for this years ARAG Big Air Freestyle Festival.